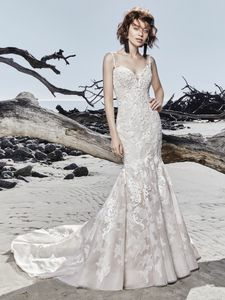 Description: Comprised of tulle and Tuscan Organza, this gorgeous fit-and-flare wedding dress features striking lace motifs layered over textured lace. Bead embellished straps glide from sweetheart neckline to unique illusion back embellished in lace motifs. Finished with pearl buttons over zipper closure. Illusion cold-shoulder sleeves accented in lace motifs included with this style for added femininity.